Yes, you can improvise! You must simply believe! Discover the first steps towards learning to improvise in this article! Improvisation is the art of rehashing sequences of melodic and/or harmonic configurations to make your own music up on the spot. Most musicians who improvise will rehash licks (melodic fragments), lines (melodic fragments), scales and arpeggios to fit the underlying harmony. True improvisation happens when a musician moves into the fourth dimension. The fourth dimension is where the musician literally lose track of time and this earthly realm and play notes that he or she would never usually play in the same musical scenario. It is as if that musician has lifted the earthly realm and moved (temporarily) into another dimension! I know it sounds eerie… but it is exactly what happens when TRUE improvisation occurs. The type of improvisation that we will discuss in this article is more to do with the re-hashing of notes/lines/licks/arpeggios and scales. Let’s call this basic improvisation. So without further ado let’s discover how you can learn how to improvise on the piano as a beginner! Step 1: Play a root note in your left hand – let’s start with the ‘F’ note! To make improvisation sound pleasant to the ear it is always easier with some sort of harmony. As this article is aimed at beginners, we will start with a very very simple idea. Just play a low F on the piano and hold that F note down. If you know how to play an octave, then you can play the F note as an octave to create a stronger harmonic sound. If you play up and down the piano’s keyboard and ONLY press the white notes whilst holding down the F bass note, you are essentially improvising using a Lydian mode or scale. The Lydian scale is a very bright and beautiful scale. It is also a scale that asks questions. “Where is the outer edge of the universe?”…. OK, perhaps I am taking it a bit far, but do try to play it – you will be pleasantly surprised! It is very satisfying, but at the same time it speaks of the secrets of the universe! Enjoy playing around the Lydian scale – you will have a really good time! Step 3: Learn the blues scale to ramp things up a little! The blues scale is a fantastic scale! It sounds great and it is pretty easy to make it sound musical! The blues scale is a 6 note scale consisting out of the following degrees: Root, b3, 4, b5, 5 and b7. It is a wonderful scale and you can have hours of enjoyment once you get to know it inside out! Inside of the song list in irealpro (the App), you should be able to find a tune called “Simple Blues”. You can use the backing track as your accompaniment and then try to play around with the wonderful blues scale in C! You need to play the C blues scale with your right hand. Step 4: Believe in yourself – YOU CAN DO IT! try to improvise at first, but it is vital to give yourself the freedom to make mistakes and give it a go. You need to let go of controlling the notes and just let your fingers flow. At first I would recommend playing the notes in any order as you prefer. Do not worry about sounding great or doing it right. Just be in the moment and go for it! If you follow the instructions above you will enjoy the beautiful sound of the F Lydian mode to your heart’s content! Simply BELIEVE in yourself and do give it a go! The sky’s the limit and you can do it! Step 5: Consider taking up some jazz or blues piano lessons to learn the tricks of the trade! Learn in London or from anywhere in the world via Skype! Learning to improvise at an advanced level requires excellent piano education. You need to understand quite a bit of musical theory (in a nice way!) and you need someone who can teach it to you in an easy-to-understand manner. 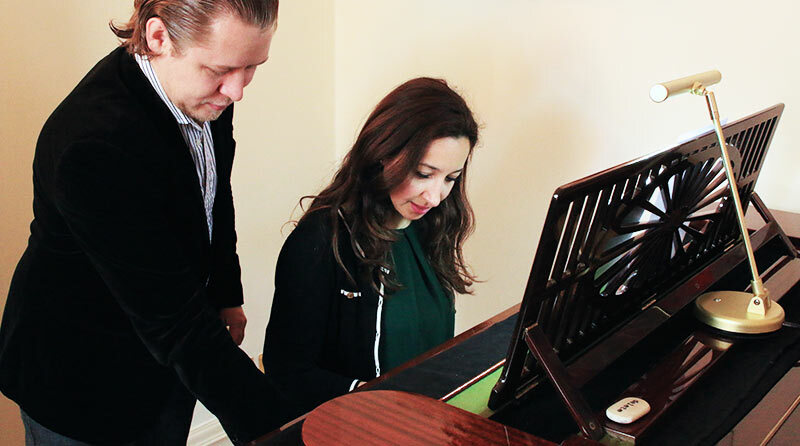 At the London Piano Institute we offer piano improvisation classes for beginners who have always wanted to learn how to improvise. Jazz piano lessons via Skype – learn from anywhere on the globe! Remember contrary to popular belief, you do NOT need any prior experience. You can learn jazz WITHOUT knowing anything about the instrument at all. Yes, learning jazz properly will require time and effort and self-study, but it is absolutely possible! Allow yourself the freedom to do what YOU have always wanted to do! Give it a go and learn how to improvise as an adult beginner today! Please contact us to find out more about our improvisation piano classes. Learn how to improvise as a beginner on the piano. Discover tips and tricks to help you get started with some basic improvisation that you can try out now!